One-stop shopping for all of your Upper School Bancroft Bulldogs Athletics Teamwear! Bancroft School has partnered with Allen’s Uniforms to create this quick and easy way to order Teamwear online. All apparel available on this website features official Bancroft Athletics logos and approved styles and designs. 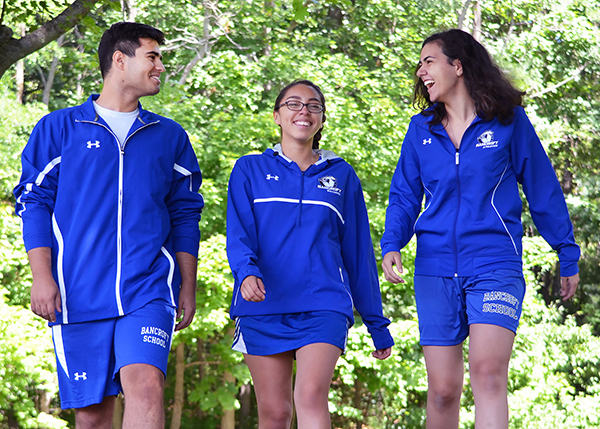 Sample sizes of Teamwear are available to try on in the Bancroft School Bookstore before you place your online order. Bancroft Athletics Teamwear is for US team athletes only. Middle School athletes, parents, siblings, and friends should visit the Bancroft School Bookstore for a wide selection of spiritwear apparel to show your school spirit! 1. Click on SHOP TEAMWEAR to go to the Bancroft Bulldogs Teamwear apparel page. 2. Choose the garment(s) your coach/captain selected and choose your size. Note: The price listed includes decoration with the Bancroft logo. You may add your name or jersey number for an additional $3.00. 3. Enter your payment information, and that’s it! For questions about the ordering process, visit the ‘Contact Us’ page on the Allen’s Uniforms website. For questions about an order you’ve already placed, please call Allen’s Uniforms at 978-534-3111 and ask for Colleen, Holli, or Carol. They will be happy to help you! We are Bancroft! We are one team! GO BULLDOGS!